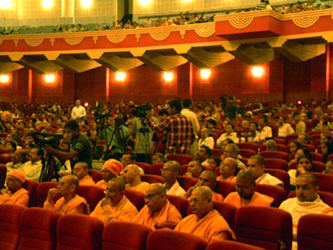 October 10, 2012, Kolkata: “Swamiji”, the long awaited laser documentary on Swami Vivekananda enjoyed a thumping success at its premier at the Grand Theater of Science City, recognized as the most prestigious and largest convention center of the State of West Bengal. 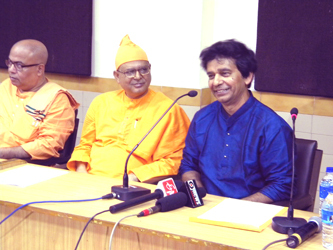 (Left) At the press conference on October 9, 2012 at Science City, from left Swami Sarvabhutananda, Secretary, RKM Institute of Culture, Gol Park, Swami Suvirananda, Asst. Secretary, RKM Belur Math (The Headquarters), and Manick. (Right) Media television cameras take position amidst partial audience as people were coming in prior to the show. It was a packed hall during the show with 2700 people. 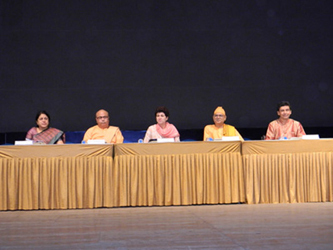 (Left) At the Guest Table on stage prior to the show, from left, Ms. Sangita Gairola, Secretary, Ministry of Culture, Government of India; Swami Sarvabhutananda; Ms. Kumari Selja, Honorable Minister for Culture, Housing & Urban Poverty Alleviation, Govt. of India; Swami Suvirananda and Manick Sorcar. 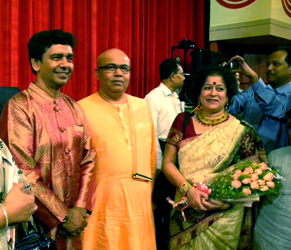 (Right) Manick Sorcar is felicitated with a bouquet of flowers, an honorary plaque, and a Kashmere Shawl from the hands of Swami Sarvabhutananda. The show was inaugurated by Ms. Kumari Selja, Honorable Minister for Culture, Housing & Urban Poverty Alleviation, Government of India, who lighted the lamp followed by Vedic Chanting by Ramakrishna Mission devotees. In her address Ms. Selja welcomed the laser show on Swami Vivekananda and said, "He was India's biggest cultural ambassador ever. For the world he was like a roaring fire of spirituality," The Guest of Honor was Ms. Sangita Gairola, Secretary, Ministry of Culture, Govt. of India. Swami Suvirananda Maharaj, Assistnt Secretary, Ramakrisna Math and Ramakrisna Mission, presided over the function and delivered the Presidential Address. 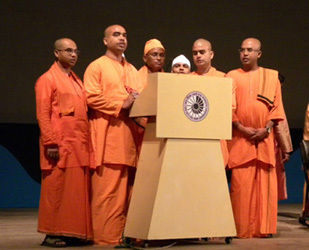 (Left) Vedic chanting by Ramakrishna Mission devotees. 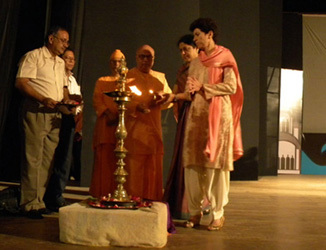 (Right) Ms. Kumari Selja lights the lamp. Ten minutes after the speech ceremony, the show started with a short introductory speech by Manick Sorcar. He briefly explained the extent of research that went behind the preparation of “Swamiji”, the hour-long laser documentary on Swami Vivekananda. “When I visited the Art Institute in Chicago, subconsciously I was seeking Swamiji’s footprints, as if they were still there – somewhere – and my research started then. I knew I was going to do a documentary on the great man who has been a source of inspiration all my life. Then, during my visit to India for shows last year, an invitation came from the Ramakrishna Mission Institute of Culture to do a laser documentary on Swamiji to celebrate his 150th birth anniversary, and my dream came true. There was no looking back”. Towards the end of the speech, he explained in general terms how laser animation worked. 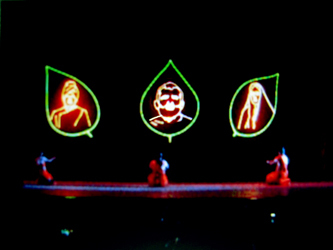 Then, as he started drawing art work with his hand-held laser pointer on the screen, the drawing magically turned into a “Bel Patra” with three leaves each carrying a picture of the Holy Trio – leading to the first item “Vandana”, a prayer dance by 5 performers uniquely mixed with laser spectacles. 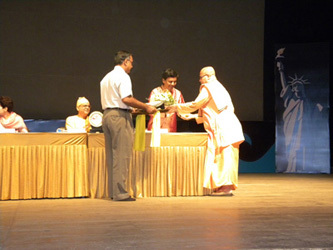 “Vandana” was followed by “Swamiji”, the highlight of the program. The one-of-a-kind light show incorporated a variety of equipment including video projectors, multiple intelligent lighting, LED trees, haze machines, surrounding sound system, a 36 ft by 14 ft laser screen etc., in addition to a dozen of color lasers, which kept the audience astonished. -“The life of Swami Vivekananda come alive through a first-of-its-kind documentary made in laser by a US-based artist Manick Sorcar on the philosopher-saint's 150th birth anniversary”, wrote The Times of India. -“Full of animation and 3D effects, the documentary uses cutting-edge laser technology to transport the audience to a world where art fuses with science seamlessly”, wrote The Hindu Business Line.